It’s summertime! That means temperatures are scorching here in Phoenix and I’ll do anything to avoid turning on the oven! With three active, growing boys though, we still need some hearty dinner options! 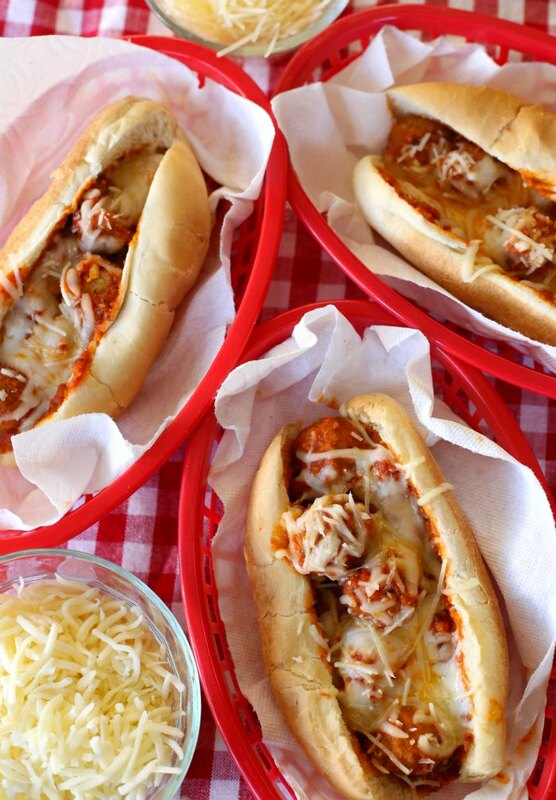 So, these easy-to-make and delicious slow cooker meatball subs are the perfect solution! The beauty of this recipe is you just dump the ingredients in the slow cooker while you go about your fun, summer day (without heating up the whole house). It’s so easy to do and tastes SO good! I LOVE a dish like that – especially in the summer! 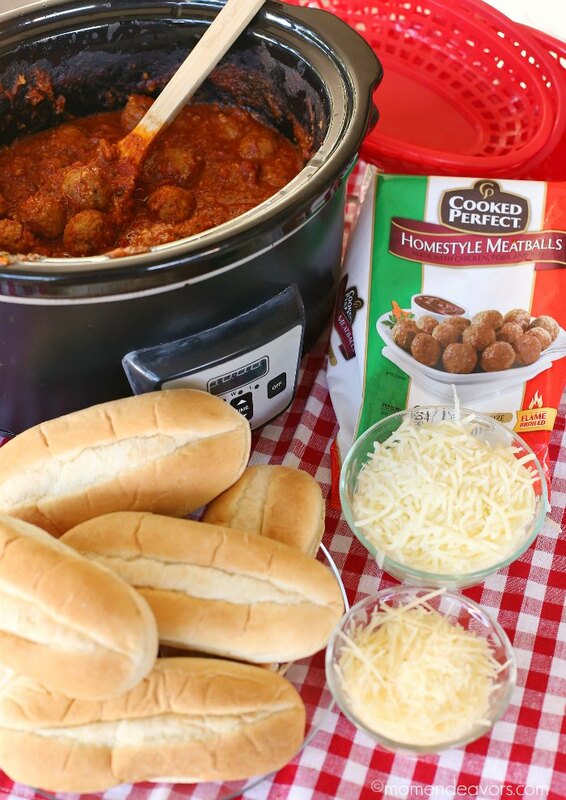 And the Cooked Perfect® Meatballs really are crafted for summer fun! These tasty little meatballs are crafted using select meats, real cheeses, and savory herbs, then flame-broiled to sear in the flavor – making them SUPER delicious!! And you can find them in a variety of flavors including Italian Style, Gluten Free Italian Style, Homestyle, Angus Beef, Turkey, Swedish, Chicken, and Sweet Italian – perfect for any recipe you’d like to cook up. Since the meatballs are already cooked and full of quality flavor, it’s a breeze to serve them up for dinner or for your summer parties! 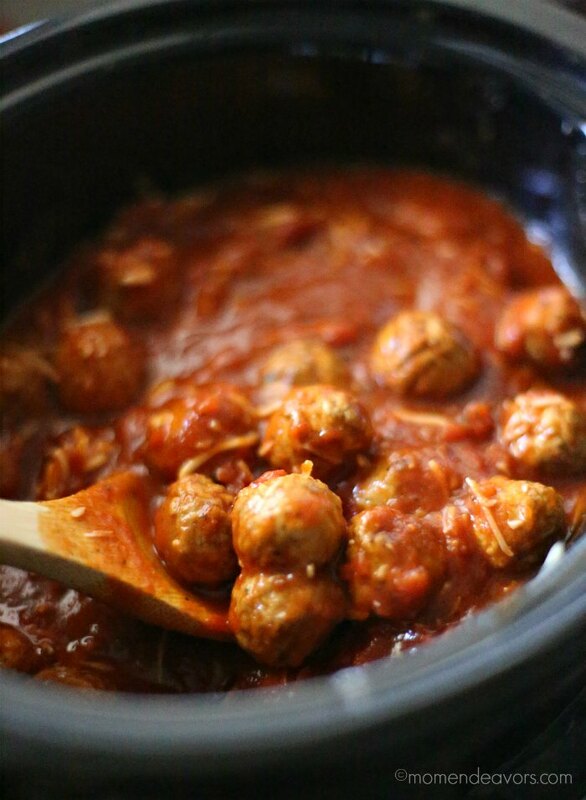 Cooking the meatballs up with some sauce & cheese in the slow cooker creates one SUPER delicious dish! I wish the smell could come through the screen right now! Don’t they look super tasty?! Everyone loves this dish at our house! You can even make a sort of “meatball sub” bar where you put out the rolls/buns, different cheeses, and the crock of meatballs, letting everyone create their own sandwich. The meatballs and sauce are good on their own. 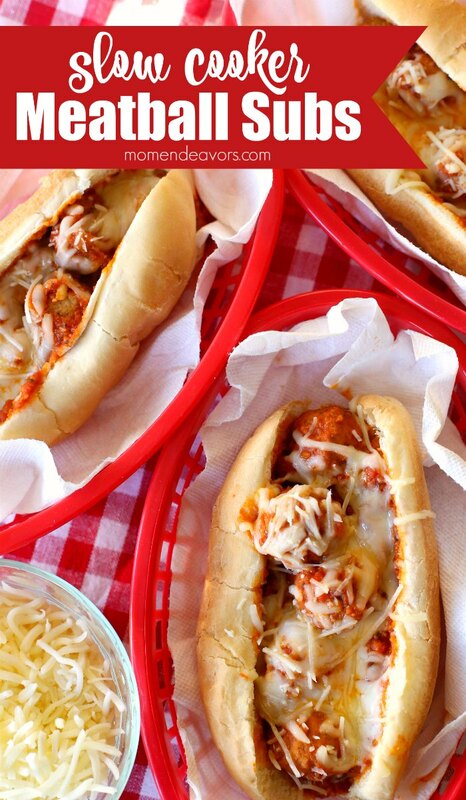 But, meatball subs are even better smothered in some cheese! So we put out mozzarella and parmesan as options (provolone would be great too). The end result is one seriously delicious sub sandwich! Pour 1 jar of sauce into bottom of slow cooker crock. Top with meatballs. Cover meatballs with second jar of sauce, 1 C mozzarella cheese, and ¼ C parmesan. Stir to combine. Place lid on slow cooker pot and cook on high for 3 – 4 hours. For sandwiches, slice buns open (optional - toast lightly before serving) and spoon the meatballs & sauce mixture inside the buns (lining the bun with meatballs. Sprinkle meatballs with cheese(s) of choice. The heat from the meatballs will slightly melt the cheese in the sandwich. Or, you can place the subs in the microwave for 30 seconds to melt the cheese. You can also broil them in the oven for a few seconds. Yum! The end result is SO good! It’s one seriously delicious meal with very little effort, allowing you to have more time for summer fun! 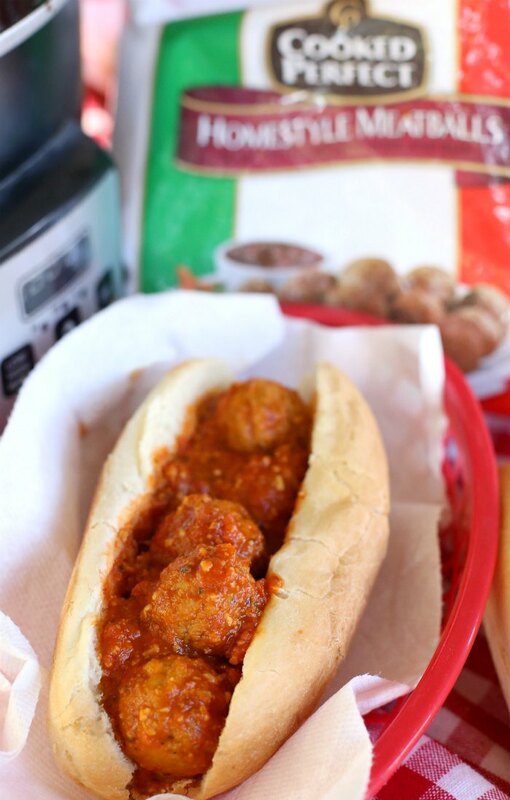 So, head to your local grocery store to stock up on the meatballs and other ingredients for this dish! 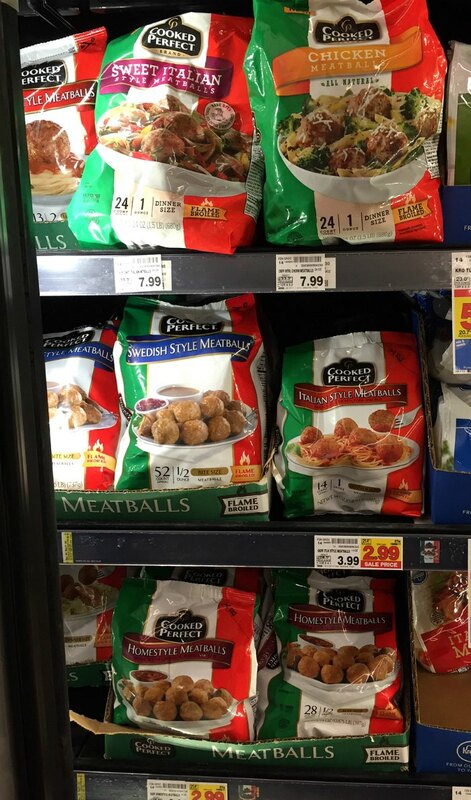 Check out the store locator to Find Cooked Perfect Meatballs in your area! And, be sure to check out more Cooked Perfect meatball recipes! You’re sure to find some delicious options! We personally love some one pan cheesy meatballs and these cheeseburger meatball kabobs would be a super fun twist on summer grilling! Approximately, how many will this serve? Sorry – hard to say really. Really depends on how many meatballs people put on their subs, how big the rolls are, etc. If you go with the larger hoagie-style buns, you can figure probably 4-5 meatballs (the bite sized ones) per bun. I made your meatball sub for today’s Super Bowl Sunday. 5 stars. Awesome! Thanks for commenting, Elizabeth. Glad you liked them!